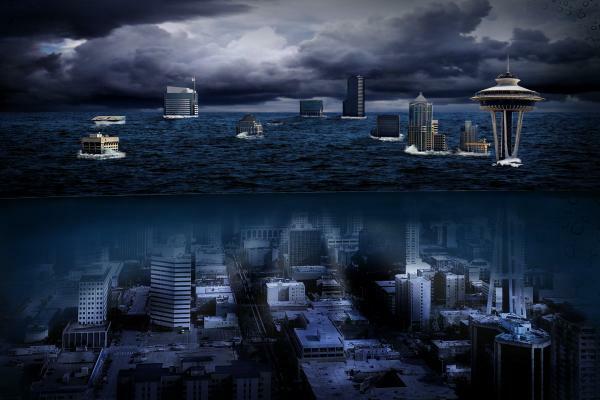 You might have missed Seattle Public Utilities’ recent Sea Level Rise Map, which predicts routine flooding throughout parts of Seattle by 2050. But Mike Foster – lower Wallingford resident – sure didn’t. And even though Wallingford looks to be spared from regular floods (thanks Ballard Locks! ), Mike is on a mission to help his neighbors get serious about stopping climate change. Mike is offering his “Climate Change for Families” presentation again this Tuesday, February 19th, from 6:15-7:30 at the Fremont Library. The presentation is targeted to families with children 10 and older, or anyone who wants to learn more about climate change and how to effectively respond. Also a therapist, Mike also recognizes that for many people, the problem of climate change can cause feelings of grief or despair. To aid people in confronting climate change without feeling alone and overwhelmed, Mike is also forming a new support group. The goal will be to give people a place grieve the loss of habitat, dialogue about their fears for the future and confront our societal addiction to oil. If you’re interested in attending one of Mike’s Climate Reality presentations, having him speak at your school, place of worship or anyplace else, or if you are interested in his climate support group, you can contact Mike at [email protected]. Thinking that humanity can influence “climate change” is like thinking you can wish TinkerBell back to health or meditate your way to levitation. “Climate change” was happening long before the first human built his first fire. The association of this scam with über-hypocrite Al Gore should give any thoughtful person pause. Only by infesting the young and inexperienced is this malmeme able to survive. The only real benefit of it is that it keeps the village idiots occupied and feeling useful. Hear hear, Assac. Thank you for having the courage to speak an alternate point of view in this group-think blog. The email for Mr. Foster is nonfunctional. @Rebecca – The email is correct, something was screwy with the hyperlink. I think I’ve fixed it, but if it still doesn’t work, please just cut and paste 🙂 Thanks for the heads up! In recognizing that global warming is a scam, Assac neglected to note that hundreds of thousand of scientists worldwide are conspriing to try to convince ordinary people that global warming is the greatest threat to the survival of life on earth as we know it. @Buster: As I said, BULLPUCKY. Since there are so many – hundreds of thousands of scientists, you claim, why not name a couple? How many of your “scientists” have Ph.D.s in reiki or aura reading? Alright Assac, I’ll bite. Neil deGrasse Tyson. PhD in Astrophysics from Columbia. James Hansen. PhD in Physics from the Univeristy of Iowa. You can also check out the Union of Concerned Scientists. In their “about” section, the names and credentials of their experts are available. The National Academy of Sciences also lists their members on their website. Both organizations believe that climate change (to the degree that we are seeing it today) is caused by human activity. Assac: Assuming that providing what you asked for will help reduce your skepticism, let me add to Kimberly’s telling points that the 2007 Nobel Peace Prize was awarded to the Intergovernmental Panel on Climate Change representing the work of thousands of Ph.D.s in such fields as climatology, physics, astrophysics, chemistry, oceanography, etc. Check the IPCC’s roster for all the names you need. I’m sure all those well established scientific organizations are no match for Assac’s (really?) gut knowledge and the dramatic overuse of capital letters. If I just spell something all in caps over and over it must be true!! Tuesday is not the 18th, it’s the 19th. Which is it — Tuesday or the 18th? It’s tonight! I’ve changed it in the text. Thanks! Also, while I do believe that 1) climate change is real (duh) and 2) climate change is exacerbated by human activity, it’s only one symptom of a whole plenty of others. Habitat removal, pollution, mountaintop removal, strip mining… these are phenomenon with clear causes and effects that are just as serious as climate change. If they won’t budge on climate change, instead of yelling louder, in the interests of pragmatism maybe it’s worth looking for another approach on common ground. The played-out stereotypical conservative response is to deny the evidence or to claim inevitability. The played-out stereotypical liberal response is to get all huffy and draw lines in the sand… protesting the destruction while enjoying the luxury afforded by it. Of course, no real people are so oblivious. Still, we’ve got to get holistic with our perspectives and start attacking the roots of these issues. If you don’t want dirty energy, waving a sign is not enough… either find an alternative and thoroughly support it, or stop living a life that is so reliant on energy use. It’s not anyone else’s responsibility to be more responsible than you. Assac, the village idiots have plenty of reason to be occupied and useful. That image isn’t helpful. Hyperbolizing the degree of sea level rise only gives fuel to the deniers, angers the believers, and distracts or confuses anyone in between.